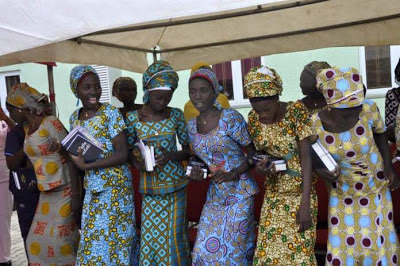 Not a single girl out of the 21 released Chibok schoolgirls was sexually assaulted during the two years spent in Boko Haram captivity. Quoting a source close to negotiations to free the remaining of those abducted in April 2014, NAN dismissed reports that the only girl who came back with a child was impregnated by an insurgent. The agency said the girl was pregnant before her abduction. “The girl and her parents have confirmed this. The child is not a Boko Haram Child,” the source reportedly said. “None of the girls released was sexually harassed or abused while in captivity by their abductors. “The current state of the girls is a source of joy as they are receiving the best medical, psychological and other forms of support from the authorities as directed by the federal government. “All groups including the families, The Bring Back Our Girls (BBOG) and Chibok Community are happy with their condition as medical experts work to address their health conditions. “The girls have been visited by members of International Committee of the Red Cross, which played a great role in getting the girls freed. Speculative reports about the state of the freed captives, are said to be creating stumbling blocks to further talks with the insurgents. The insurgents were said to be angry with government for breaching some understanding reached with them when the 21 girls were being handed over on October 13.